Indonesia is a unitary sovereign state and transcontinental country located mainly in Southeast Asia with some territories in Oceania. It has an estimated population of over 260 million people and is the world's fourth most populous country. The country shares land borders with Papua New Guinea, East Timor, and the eastern part of Malaysia. Other neighbouring countries include Singapore, the Philippines, Australia, Palau, and the Indian territory of the Andaman and Nicobar Islands. 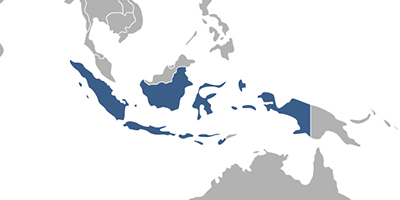 Indonesia is a founding member of ASEAN and a member of the G-20 major economies. Fees associated with registration of IP rights in Indonesia are available in the fee calculator.